AccuWeather Global Headquarters – January 15, 2017 – AccuWeather reports snow will continue to create slippery travel over a large part of the Midwest into Monday night. 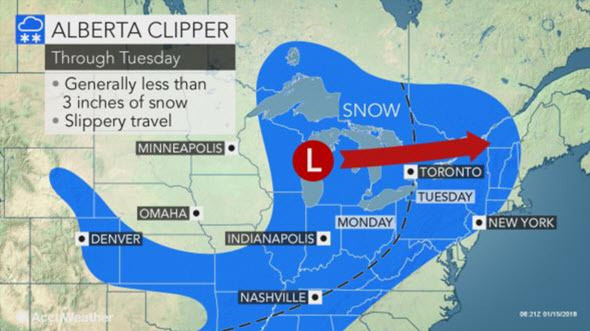 An Alberta clipper storm is not anticipated to rival the powerful snowstorms that have pounded the United States so far this winter but will lead to travel difficulties and disruptions to daily activities. After coating roads to end the weekend in Minneapolis and Rapid City, South Dakota, the snow will blanket Chicago, Indianapolis and Cincinnati on Monday. The snow will have no trouble sticking to roads and sidewalks with temperatures mostly in the teens and 20s. Motorists planning to drive on stretches of Interstate 35, I-70, I-75, I-80, I-90 and I-94 should prepare for slower travel. Delays and some cancellations may affect airline passengers. Ski enthusiasts and snow removal companies will welcome the fresh snow. Snow and an icy mix will plunge into Arkansas, Tennessee and Texas from Monday night into Tuesday. The storm will split up upon crossing the Appalachians, but two new storms are forecast to form at midweek. One storm will spread accumulating snow across Virginia and North Carolina, while a second storm spreads moderate snow across New England. In between light snow is forecast over much of the mid-Atlantic on Tuesday night and into Wednesday. Untreated roads that are initially wet as the snow starts can eventually turn icy and slick as temperatures plummet. Fresh cold air will follow the storms but will be quick to release its grip. Another surge of milder air is set to arrive by next weekend.